This post is by Ruth Millikan. 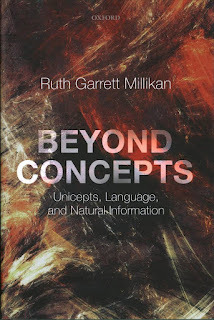 Ruth Garrett Millikan is Distinguished Professor Emerita at the University of Connecticut. She is a Member of the American Academy of Arts and Sciences, and Winner of the 2017 Researcher Prize for Systematic Philosophy. I am a retired professor of philosophy from the University of Connecticut with special interests in thought and language, the ontological structures of the world that support thought and language and the kinds of selection ---- genetic, learning, cultural ---- responsible for their evolution and development. Beyond Concepts weaves together themes from natural ontology and from the philosophies of mind, language and information. The sprawling topic is Kant's how is knowledge possible? but viewed from a contemporary naturalist standpoint. The assumption is that we, along with the other animals, are evolved creatures that use cognition as a guide in dealing with the natural world, and that the natural world is, roughly, as natural science has tried to describe it. Very unlike Kant, then, the book begins with a discussion of what the world is like prior to cognition, only later developing theories about the nature of cognition within that world. Central to the view of cognition is the introduction of “unicepts” and “unitrackers” which, together, serve to replace traditional concepts. They are responsible for “tracking” items perceived in different ways and at different times, for recognizing what is the same again as the same again and for storing information thus collected in a way that marks it clearly as information about the same. A novel description of the act of recognizing an identity is central. The ways that various unicept complexes may be developed from experience over time is explored, one conclusion being that the law of noncontradiction acts as a regulative principle in the fashioning of unitrackers, coherence serving as a test for correspondence. The training of unitrackers is not always successful but sometimes leaves behind redundant, equivocal or even empty unicepts or “would-be” unicepts. In moving from ontology to cognition another non-Kantian domain is traversed as new answers are offered to questions about the transmission of information through natural signs, on the one hand, and through intentional signs including both thought and language, on the other. A general theory of signs emerges that includes natural signs, animal communication, maps and charts, mental representations as well as linguistic signs and a classification is attempted of the various kinds of relations that may be involved in the mapping of a sign element onto its signified. Strikingly, one such relation is identity. Some sign elements are selfsigns (the place of a stop sign, the referent of an indexical or demonstrative). A novel view of the semantics-pragmatics distinction also results and a description of the semantics of natural languages according to which nonaccidentally true linguistic signs are like natural signs as well as being intentional signs of what they represent. (Exclamations of “It’s raining” are usually signs of rain.) Defending and then arguing from a new semi-Gibsonian theory of perception then yields the conclusion that, rather than involving Gricean inference, the typical process of understanding a language is or is importantly similar to a form of perception.